Our all styles Kickboxing is a full/light contact combat sport that allows techniques to be used from a variety of combat sports and traditional martial arts. It is a mixture of Boxing, Muay Thai, Savate, Kickboxing and Taekwondo. Techniques fall into Striking from Standing (punching, elbows, knees and kicks), and Clinching (sweeps and some take downs from Muay Thai). Balance is a highly technical and safe environment. If you want to compete, learn the fundamentals or are fan wanting to get in shape, our all styles programme can meet your needs. 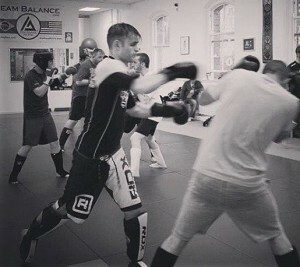 Our Striking class: Punching and kicking from many different styles, working to clinch. Developing effective striking from all distances, punch bag and pad work. Italian National Pro Kickboxing Champion.